How to Quantify the Shape of an Area In a previous post, I mentioned that Fred Calef and colleagues (2009) identified several quantitative measures helpful in distinguishing secondary impact craters from primaries on the surface of Mars. Two of the useful measures that should also be useful for evaluating craters on Ceres are the Form Ratio and the Circularity Ratio. Described by Keith Selkirk (1982) as measures for quantitatively representing the shape of geographic areas on Earth, such as drainage basins, they are also useful for determining the "compactness" of geomorphological features elsewhere in the Solar System. Circularity Ratio Circularity is a ratio of a region's area to its perimeter. Selkirk observes that a longer perimeter relative to a shape's area results in a more convoluted shape. A shorter perimeter relative to the area is more compact, with the ideal compactness occurring with a circle. 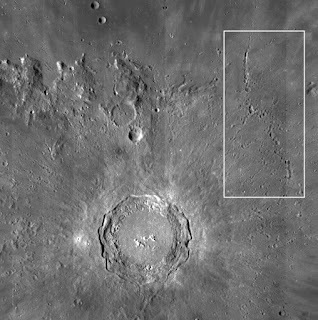 Large impact craters are surrounded by secondary craters, appearing alone, in clusters, in lines, or even in loops. These craters extend to many crater radii from the primary (see Figure 1). I'm concerned about secondary craters since multiple ejecta projectiles from a large impact could easily strike the surface in proximity to each other simultaneously... looking very much like a doublet crater. Jay Melosh (1989) points out that as the range from the primary crater increases, secondary craters are more dispersed and their shapes are more circular. The improved circularity of distal secondaries results from the projectile's higher velocity, and the highest velocity ejecta is typically going to travel the furthest. The lower density of secondary craters combined with them being more circular, means they look a lot like primary impact craters! A Fortunate Encounter During the poster session at #LPSC2017, I was surprised and delighted that Jay Melosh stopped to discuss my poster on doublet craters. 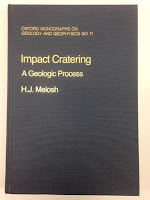 Not only had I cited some of his papers in my work, but he also "wrote the book" on Impact Cratering (no, really!). Dr. Melosh was genuinely interested, and also pleased to see that my co-author (and graduate advisor) was Ron Fevig, a former student of his at the Lunar and Planetary Laboratory at U of A.
he noted that the ones I had identified as "highly eroded" (see figure 2) may not be that eroded, but were possibly secondary craters, since their rims were irregular rather than cleanly circular. He also referred me to his book for a good description.